If you’re like most consumers today, you’ve done your homework regarding your boat dock needs. Spending countless hours online researching dock styles from aluminum, steel, poly or wood have you feeling like a dock expert. So you might be wondering why so many dock companies require you to purchase from an authorized dock dealer and not direct. Authorized dealers in the marine industry have experience in an ever changing environment. Let’s be honest, each lake is unique and Mother Nature affects your fixed pier or floating dock. A bad storm can destroy the most structurally sound docks. Rapidly rising and lowering water levels on rivers can make accessing your dock impossible. Leave your dock in the water during winter, you could spend a small fortune in replacement dock hardware and poly floats. Although, it’s impossible to predict Acts of Nature, you can utilize the knowledge of a local dealer to minimize possible damage and loss. What Services Does An Authorized Dock Dealer Provide? Authorized dock dealers provide knowledge and experience…plain and simple. First, local dealers know conditions at the lake site. Details such as water level, lake or river bed type, aquatic life, and marine impact affect the type and style of dock to install. Secondly, they know the requirements for local agencies such as the ODNR or USACE. Having contacts in these agencies helps speed the permitting process. There is nothing more frustrating than to design your dream boat dock only to find it doesn’t fit the guidelines of your lake community. Third, the ordering process for your dock is simple! Your authorized dock dealer knows exactly what to order from the dock manufacturer saving you additional time. Lastly, they deliver and install the product so you can truly enjoy boating season. Let’s talk about installing your boat dock for a minute. The safety of your family depends on proper installation of your dock. Have you ever built a wood dock? 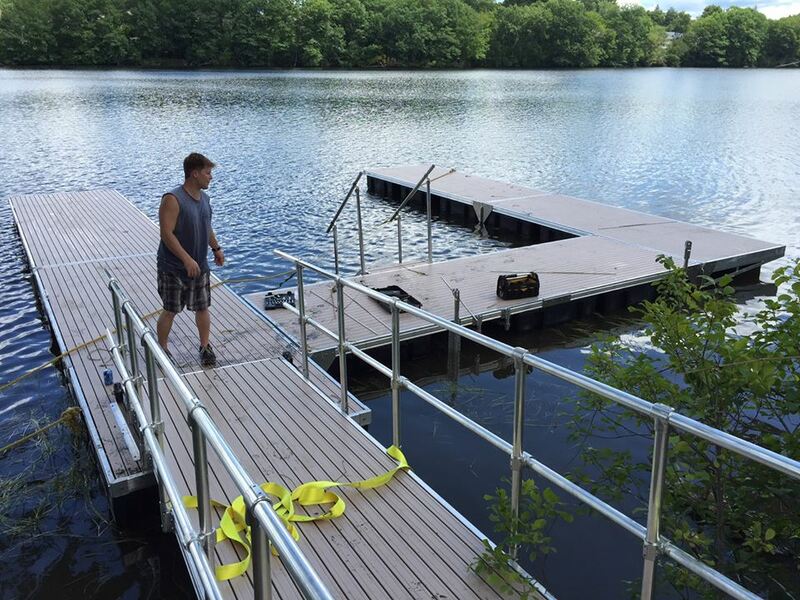 What about installing a dock system, whether it was aluminum piers or poly floating dock? If you’ve done either of these things and still want to install yourself, then I applaud your effort. However, installing a dock can be frustrating and time-consuming, especially if you have limited experience or none at all. It can also put you and your family at risk for injury if not done properly. If your dock isn’t properly anchored, your expensive watercraft can be damaged, too. Authorized dealers already have this learning curve. They’ve already been down this road anticipating issues you never see coming. Plus, they already own the equipment to install. In some areas, the use of a barge or air-bags makes install fast and reduces the possibility of injury. It might seem crazy when your authorized dock dealer tells you it will take half a day for your installation. 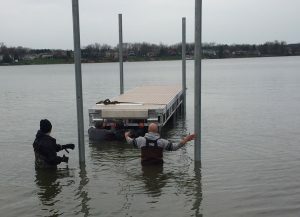 Despite your initial reaction, trust me when I tell you that unless you are a marine contractor yourself, you will not be able to properly install a stationary or floating dock in the same time frame as an experienced authorized dock dealer. Maintaining your dock is just as important as the installation process, if not more so. Authorized dock dealers provide maintenance typically as part of their seasonal removal and install process. They will check all of your dock hardware is tight and properly connected. Dealers will make recommendations if parts are showing signs of wear or fatigue. Often times, they will have the new part ready to replace tired, worn items. Most importantly, the dealer knows your docks, the parts installed and all of your accessories. This makes part orders from the manufacturer seamless. Repairs to boat docks by unauthorized companies or with off-brand dock parts can possibly void your warranty. Am I Paying More By Working With An Authorized Dealer? You might be asking yourself what the additional cost is in working with an authorized dealer. I would ask how much are you losing by not working with an authorized dealer? There is a misconception out there that you pay more than fair market value for products when you purchase from a dealer. I repeat, this is a misconception. The suggested list price or MSLP is determined by the manufacturer based on the market for the product. This price is not determined by the dealer and is, in most cases, the same price as if you ordered directly from the manufacturer. The difference is the manufacturer doesn’t know the specifics of your lake and your dock. You’ll find that this missing piece of the puzzle costs you more in returning parts and shipping costs. In addition to lost time completing your installation or repairs. This also brings us to the topic of purchasing used boat docks. There is nothing more exciting than finding a used dock system at a fraction of the price new. I caution you, thoroughly review the system. If the price seems too good to be true, it probably is. Your “deal” could cost you far more down the road in replacement parts and repairs. Authorized dock dealers will sell used aluminum dock sections and parts. This is only after they have determined the dock is structurally safe. They will usually replace any worn hardware or damaged parts. Occasionally, authorized dealers will take used dock sections in on trade for a brand new system. Trade-ins are not always available, though. At the end of the day, working with an Authorized Dealer does not cost more. It is actually saving you money, time and frustration. When Should I Contact An Authorized Dock Dealer? You should contact an authorized dock dealer as soon as possible. The best time to plan your next dock purchase is in the off-season. Any quality or good marine contractor is busy at the beginning of April through July, especially in the northern part of the country. It should not surprise you if you call in May and are told the lead time is 4-6 weeks. Or in June that the contractor isn’t able to quote your project for a week or so. Think of peak boating season similar to going to a store on Christmas Eve. It’s unrealistic to think the store will be fully stocked with every item you want available and cashiers falling over themselves to cash you out. Especially since people have been shopping in the weeks leading up to the holiday. Well, dock season is very similar. Spring and summer are short seasons in many parts of the country. The first 60 degree day in February starts the flood of pre-season phone calls. Schedules for the dealers start taking shape and fill up fast, especially for the good contractors. You’re already way behind in the season waiting until May or June for a new summer dock. With this being said, it’s never too late to purchase your new residential piers or marina docks. It is possible to order a new dock in July and still have it in time for late evening boat rides in August and September. What Requirements Are There To Become An Authorized Dock Dealer? Authorized dealer qualifications vary by dock manufacturers. Here at Metal Craft Docks, we hand select authorized dealers whose practices mirror ours. We vet each business or individual, looking for the same levels of service and satisfaction that we would offer at every lake if we could. Many of our Metal Craft authorized dealers came from customer referrals! Our successful authorized dealers have strong service records, satisfied customers, and operate at a high level of experience in the marine industry. Where Do I Find An Authorized Dealer? In our experience, there are two consistent themes for successful authorized dealers. The most successful dealers live on or own a marine business near the lake they service. When your dock dealer is a year round resident of your lake home community, they are typically updated on HOA or POA guidelines. A new policy or change in bylaws can derail your perfectly planned dock project. Marine contractors with shops on the lake do well, too. Shorter travel times to lakefront homes means more time for service, more jobs completed and happier customers. Often times, authorized dock dealers stock the products they sell. This reduces “down time” if your marine dock system or vertical boat lift needs parts. Authorized dealers provide factory made parts so safety and reliability are never a concern. With some planning and the guidance of an authorized dock dealer, your dock purchase will go smoothly. If it’s a Metal Craft Aluminum Dock, you’ll have it for a lifetime to enjoy. When you’re ready to begin the process of purchasing a new Metal Craft Dock system, select from our authorized dock dealer list.